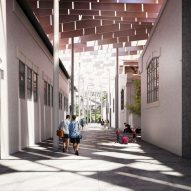 Kengo Kuma and OODA have paired up to transform a disused slaughterhouse in Porto into a cultural centre, which will feature art galleries and a library beneath a sweeping ceramic-clad roof. The Matadouro slaughterhouse is situated in the parish of Campanhã and was previously considered as one of the area's major economic contributors. However since its closure in 1990, a number of developments – including the FC Porto Stadium and a busy highway – have been constructed around the building, isolating it from the rest of the city. 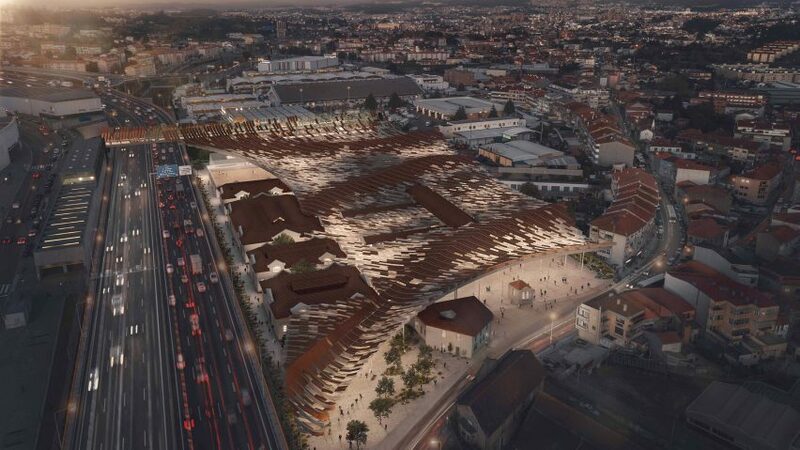 Kengo Kuma & Associates and Portuguese architecture firm OODA worked together for an international competition seeking proposals to reconnect the 20,500 square-metre slaughterhouse with Porto and "re-establish the site's importance in the city's cultural, business and social network". "With this proposal we intend to reactivate, reinvent, and engage the local history and memory of the city. In order to achieve this goal, it is essential to create a structure that will have a strong sense of presence from afar," said the practices in a joint statement. 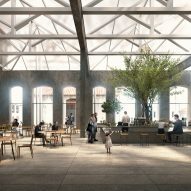 Renders show the former abattoir overhauled to contain several new leisure spaces, including an art gallery, museum, cafes and an extensive library with dramatic floor-to-ceiling shelving for books. 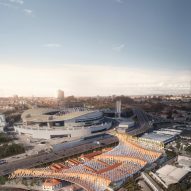 The building will be reached via a greenery-lined outdoor walkway that offers visitors views across the eastern parts of the city, or can be accessed at street level through two public squares that will also be used for events. The entire structure is shown topped by a sweeping roof covered in swathes of red-hued ceramic tiles in a visual nod to the material palette of local houses. 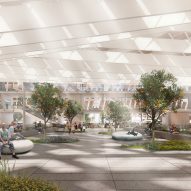 The roof will also be punctuated by numerous glass panels, intended by the architects to behave as a "second skin" that lets daylight filter through to the building's interiors and simultaneously illuminates the area at night. Earlier this year Kengo Kuma's pratice also unveiled its design for an aquatics centre and harbour baths in Copenhagen, which will feature indoor pools framed by pale-brick pyramids. The Japanese studio is also nearing completion on the V&A Dundee, Scotland's first major design museum.